The Future Of 'Wild Fish,' The Last Wild Food Almost half of the fish we eat has been raised on farms — and the genetic modification of fish is increasing. Paul Greenberg writes about changes in the fishing industry — and what the future holds for our dinner tables — in his book, Four Fish: The Future of the Last Wild Food. Paul Greenberg, pictured here with his daughter Tanya, has been fishing striped bass since childhood. He frequently writes about fish for The New York Times. This interview was originally broadcast on July 19, 2010. Four Fish: The Future of the Last Wild Food is now available in paperback. 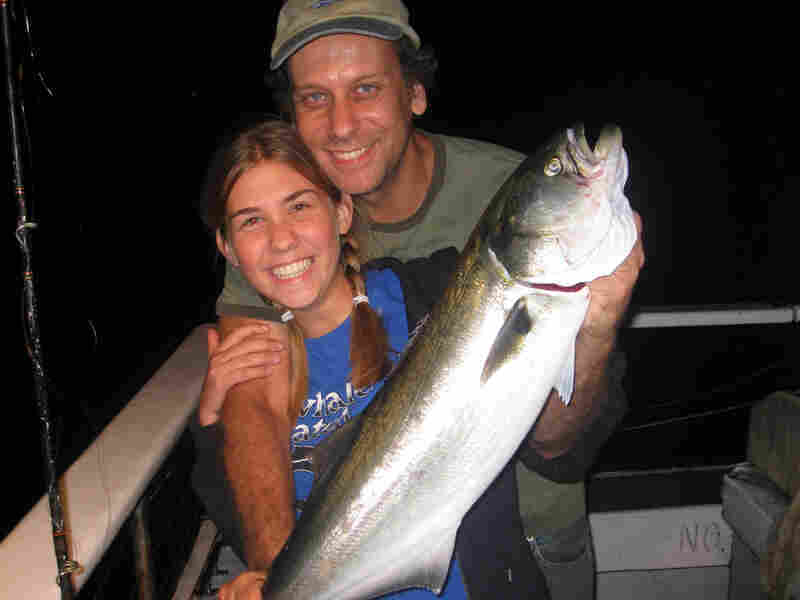 Writer Paul Greenberg has been eating fish caught in local waters since he was a kid growing up in Connecticut. Most of the fish he caught himself — but occasionally, he would visit the fishmonger in his hometown and purchase wild fish, fresh from the sea. But when he visited fish markets as an adult, he realized that the types of fish for sale had changed. Instead of a variety of wild-caught fish, Greenberg saw four varieties of fish — salmon, sea bass, cod and tuna — that seemed to consistently be on fishmongers' shelves, despite having little to do with the waters adjacent to his local fish market. 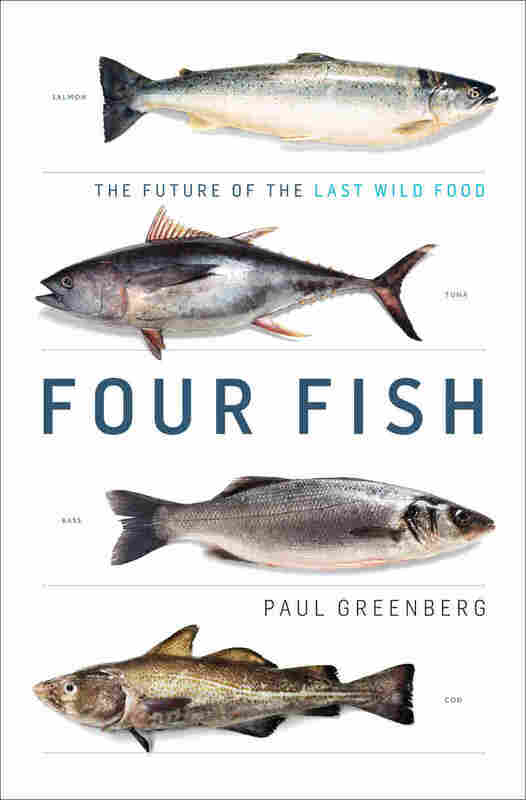 In his new book, Four Fish: The Future of the Last Wild Food, Greenberg investigates how those four fish came to dominate the seafood market, and examines how the wild fish industry has changed in the past three decades as the business of fishing became more industrialized. "Fish were different 35-odd years ago, when I was a kid, and I would often visit fish markets no matter where I was," he explains to Fresh Air's Terry Gross. "By and large, what we would see would be entirely wild fish. Forty-odd years ago, everything we ate from the sea was wild. Pretty much everything. Today almost half of what we eat is farmed. So it's a huge, huge shift." "The way humans have used fish, we started inland and moved further and further offshore. Salmon represent that first step. Salmon spawn in freshwater rivers. They're nearby. And we have this very close interaction with them where we live. So they were one of the first fish that we really hit hard with industrialization. Dams and pollution and all of these different things caused wide-scale extirpation of salmon, particularly Atlantic salmon, throughout their range. And now what we've seen is, salmon was really the first large-scale domestication project for the fish that we eat. There are many more farmed salmon in the world than wild salmon, and it's a kind of replacement of a wild-food system with a domestic-food system that has started to kind of be kind of a model moving forward." "What do salmon eat? Well, on the farm what they eat is other fish. And where do those fish come from? The wild. So the global catch right now in the world is 90 million tons, which is a lot. It's equivalent to the human weight of China removed from the sea every year. A third of that is what they call forage fish — herring, anchovies, little things like that. And incidentally, the weight of all of those taken out of the sea every year would be the equivalent of the human weight of the United States taken out every year. Those are harvested every year. They're made into feed pellets. And in the early days of aquatic agriculture, the feeding was extremely inefficient, there wasn't a great deal of care to make sure the salmon actually ate what they were fed. So there was a lot of waste, and I think in 2000, the journal Nature published a study that the fish-in, fish-out ratio ... could be as much as three pounds of wild fish to make one pound of salmon. ... That's a pretty screwy equation. Why are we coming up with a net marine protein loss? "But to its credit, the salmon industry took this very seriously. ... It's also an economic factor for them — it's expensive buying all of that feed — and over the years, they've instituted a selective breeding program with salmon, mostly in Norway. They took the 40 original salmon strains in all of these different rivers in Norway, and they crossed them and they recrossed them, and they came up with eventually with a salmon that required half the original feed of the original wild variant. ... But the industry keeps growing. So while per-fish efficiency is better, the overall footprint of the salmon industry is just bigger and bigger." "What cod represents is sort of this epic industrial move to the continental shelves, where, beginning around the Middle Ages, huge aggregations of cod were found, first off of Europe. But then people ... would posit that that's what brought the Vikings to the New World in the first place. There were these huge amounts of cod on the Grand Banks in Canada and then off of Massachusetts. They sort of represent the industrialization of fishing. If all of that cod hadn't been found, I don't think we'd have a fish stick today. And it's the sort of re-imagining of fish — not as this local, artisan product but as this mass-scale, industrial thing that fills up our supermarkets and our fast-food restaurants." "I think it's kind of a neutral fish. Tilapia — because they don't eat a lot of fish meal, they don't fit the omega-3 profile that so many nutritionists say we should be having. That said, as a form of protein, it's better — I think — to eat a low-fat fillet than a big chunk of beef or even pork or chicken. It's just leaner. ... Overall, I eat tilapia. In the profile of food we have to eat out there, I think it's certainly a better choice than beef." The more I thought of it, the more I realized that the four fish that are coming to dominate the modern seafood market are visible footprints, marking four discrete steps humanity has taken in its attempts to master the sea. Each fish is an archive of a particular, epochal shift. Salmon, a beautiful silvery animal with succulent pink flesh, is dependent upon clean, free-flowing freshwater rivers. It is representative of the first wave of human exploitation, the species that marks the point at which humans and fish first had large-scale environmental problems and where domestication had to be launched to head off extinction. Sea bass, a name applied to many fish but which increasingly refers to a single white, meaty-fleshed animal called the European sea bass, represents the near-shore shallow waters of our coasts, the place where Europeans first learned how to fish in the sea and where we also found ourselves outstripping the resources of nature and turning to an even more sophisticated form of domestication to maintain fish supplies. Cod, a white, flaky-fleshed animal that once congregated in astronomical numbers around the slopes of the continental shelves many miles offshore, heralded the era of industrial fishing, an era where mammoth factory ships were created to match cod's seemingly irrepressible abundance and turn its easily processed flesh into a cheap commoner's staple. And finally tuna, a family of lightning-fast, sometimes thousand-pound animals with red, steaklike flesh that frequent the distant deepwater zones beyond the continental slope. Some tuna cross the breadth of the oceans, and nearly all tuna species range across waters that belong to multiple nations or no nation at all. Tuna are thus stateless fish, difficult to regulate and subject to the last great gold rush of wild food — a sushi binge that is now pushing us into a realm of science-fiction-level fish-farming research and challenging us to reevaluate whether fish are at their root expendable seafood or wildlife desperately in need of our compassion. Four fish, then. Or rather four archetypes of fish flesh, which humanity is trying to master in one way or another, either through the management of a wild system, through the domestication and farming of individual species, or through the outright substitution of one species for another. This is not the first time humanity has glanced across the disorderly range of untamed nature and selected a handful of species to exploit and propagate. Out of all of the many mammals that roamed the earth before the last ice age, our forebears selected four — cows, pigs, sheep, and goats — to be their principal meats. Out of all the many birds that darkened the primeval skies, humans chose four — chickens, turkeys, ducks, and geese — to be their poultry. But today, as we evaluate and parse fish in this next great selection and try to figure out which ones will be our principals, we find ourselves with a more complex set of decisions before us. Early man put very little thought into preserving his wild food. He was in the minority in nature, and the creatures he chose to domesticate for his table were a subset of a much greater, wilder whole. He had no idea of his destructive potential or of his abilities to remake the world. Modern man is a different animal, one who is fully aware of his capability to skew the rules of nature in his favor. Up until the mid-twentieth century, humans tended to see their transformative abilities as not only positive but inevitable. Francis Galton, a leading Victorian intellectual, infamously known as the founder of eugenics but also a prolific writer on a wide range of subjects including animal domestication, wrote at the dawn of the industrialization of the world's food system, "It would appear that every wild animal has had its chance of being domesticated." Of the undomesticated animals left behind, Galton had this depressing prediction: "As civilization extends they are doomed to be gradually destroyed off the face of the earth as useless consumers of cultivated produce." And that brings us to the present day, the crucial point at which we stand in our current relationship with the ocean. Must we eliminate all wildness from the sea and replace it with some kind of human controlled system, or can wildness be understood and managed well enough to keep humanity and the marine world in balance? 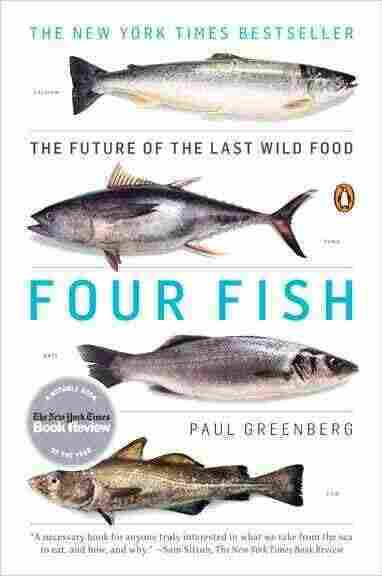 Excerpted from Four Fish: The Future of the Last Wild Food by Paul Greenberg. Copyright 2010 by Paul Greenberg. Excerpted by permission of The Penguin Press HC.